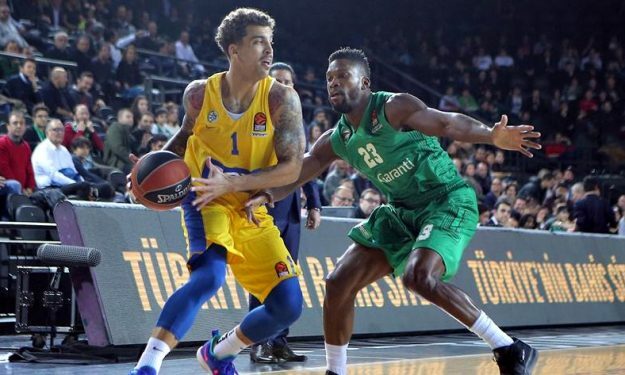 The return of Scottie Wilbekin in Istanbul proved to be a comeback win against his former team, Darussafaka. Darussafaka Tekfen had things under control for three quarters, but Maccabi FOX Tel Aviv turned things around and got the big 73-71 road win. Scottie Wilbekin was held to two points and just 1/9 FG during the first 30 minutes of action, still, he made three crucial threes in the last quarter and saved the day. However, the biggest play of the night belongs to Yovel Zoosman who blocked Ray McCallum in the closing seconds and secured the win. Maccabi finished the game with nine blocks, Wilbekin had 11 points and the duo of Tarik Black (10 p. 8 r. 5 bl.) and Johny O’Bryant (12 p. 14 r.) controlled the paint. The Israelis had a mediocre first half after which they were trailing by six (42-36) and fell victim of a 7-2 run (49-38) at the start of the third quarter. Maccabi couldn’t keep up and the hosts entered the last period with a solid 62-51 lead. And suddenly the guests came back to life. Thanks to four threes, two of them made by Wilbekin, Maccabi made it a two-point game (65-63) with five minutes left. Kendrick Ray with another three tied the score at 68, three minutes before the final buzzer, Angelo Caloiaro gave to Maccabi the 70-68 lead and Wilbekin hit it again, making the score 73-68. As Maccabi’s coach Giannis Sfairopoulos said: “I think what’s most important is we never game up and we fought until the end. That was the most important part. Unfortunately, in the first three periods, we didn’t perform well defensively. But we did all the great job and big effort we saw in the fourth quarter, allowing them only nine points. At the other end, we got the rhythm, we scored tough shots, big shots, and came back to the game. After that we had the momentum and, in the end, how the game went, we deserved the win”. With the new addition, Toney Douglas scoring 14 points in his debut with his new team and Michael Eric finishing the night with 20, Dacka seemed to be close to their second win of the season. In the end, despite their solid effort, they were left with a 1-10 record, while Maccabi got their third win in the season. “This win is a big win and it belongs to the players. That’s why they celebrated a lot in the locker room. They deserve this type of win“, concluded Sfairopoulos.